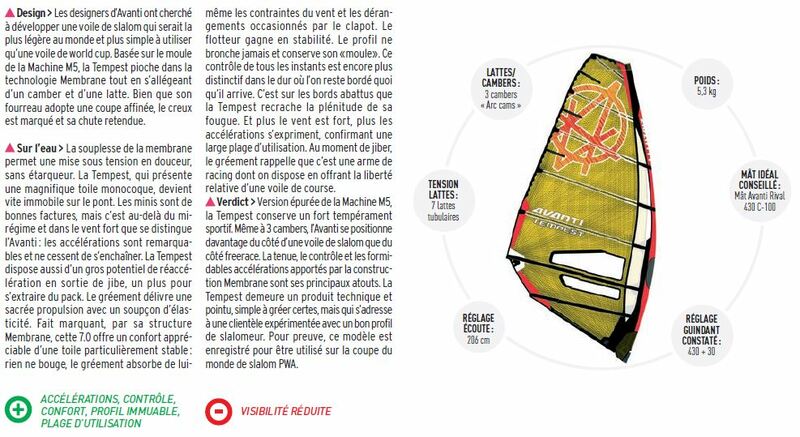 The Tempest which is our new light weight Slalom sail for the 2017 season was recently featured in the French Windmag. We have had the test translated into English for your reading pleasure. The avanti designer were looking to develop the lightest and more user friendly slalom sail on the market. Based on the mold of the Machine M5 (pure PWA slalom sail) the Tempest uses the same Membrane technology with one less camber and batten. The luff pocket is finely cut, the draft is deep and the leech retightened. The softness of the membrane makes it easy to rig without the use of a tensioner. The tempest presents a magnificent mono shell that stands still on the deck. The details are well made and the sail shines in stronger winds. The accelerations are exhilarating and goes on and on. The Tempest also posses a huge potential of re-accelerations on the jibe exit so you can get away from the pack. The rig gives great power with a slight elasticity. Highlight of the sail is the membrane structure that gives the sail great comfort and amazing stability, nothing moves, the sail absorbs the constraints of the wind and water chop giving also board stability. The profil of the sail never moves and keeps its original ”mold”. This permanent control is even more distinct when the wind picks up as you keep the sail locked and you feel the accelerations. This is were you feel the huge range of the sail. On the jibe the rig reminds you that its a race weapon with the relative freedom of a race sail. Streamlined version of the MACHINE M5 the TEMPEST keeps its racing feeling. Even with 3 cams, the Avanti is positioned towards slalom sails rather then the freerace ones. 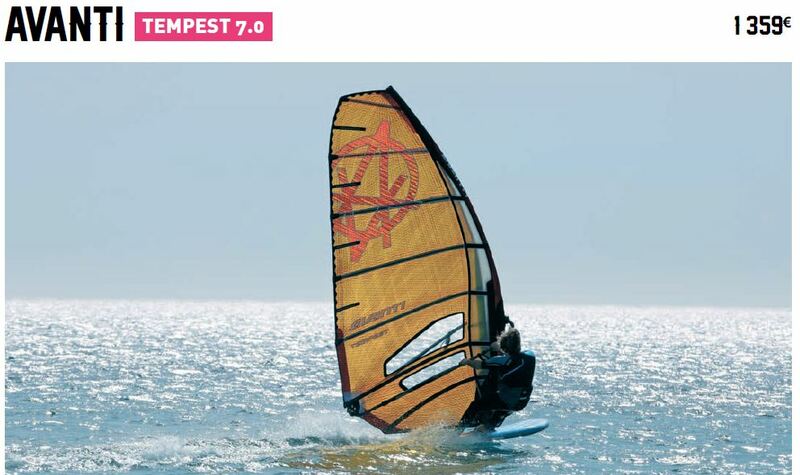 The handling, control and amazing accelarations given by the membrane construction are its major strengths.The tempest is a leading-edge and technical product, easy to rig, but still for experienced rider with good technical slalom skills. As proof, the sail is registered on the PWA slalom world tour !